Product code: ES3276 Categories: Sold Items, Sold Rings. 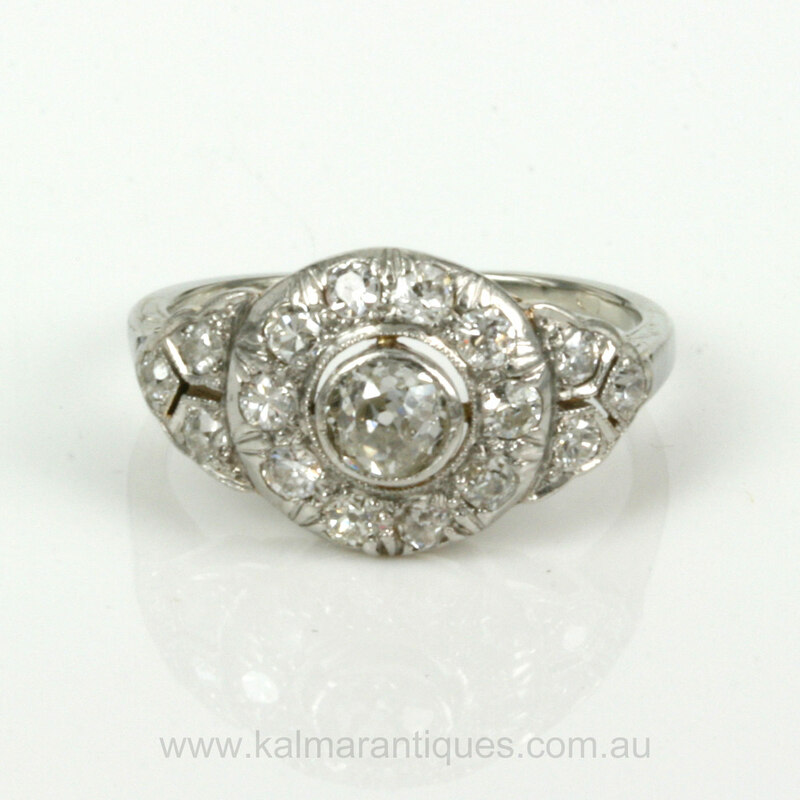 Here is a wonderful Art Deco diamond cluster ring that really stands out on the finger and would make a stunning Art Deco diamond engagement ring or a fabulous diamond ring for any other finger. All hand made in 14ct white gold and platinum in Austria in the 1920’s, this diamond ring has all the characteristics of the desirable Art Deco era of this time. Starting off you have a traditional diamond cluster design of one diamond surrounded by 10 diamonds then you have the fabulous detail on each side set with three more diamonds to add to the elegance of this diamond ring. Looking close, you will see that the centre diamond is actually set into its own bezel separate from the cluster of surrounding diamonds which makes this ring look even more superb when it is on the finger and the skin tone comes through. The centre diamond weighs 0.38 carats and the 16 other diamonds have a total weight of 0.80 carats bringing the total weight of all the diamonds to 1.18 carats giving this ring certainly a great amount of sparkle. Typical of the jewellery work from the Austrian and even Hungarian jewellers of the time, there is the most subtle and elegant hand engraving on the side which adds to the charm and character of this ring and is just one of the many features that are often found on Art Deco diamond rings such as this one. 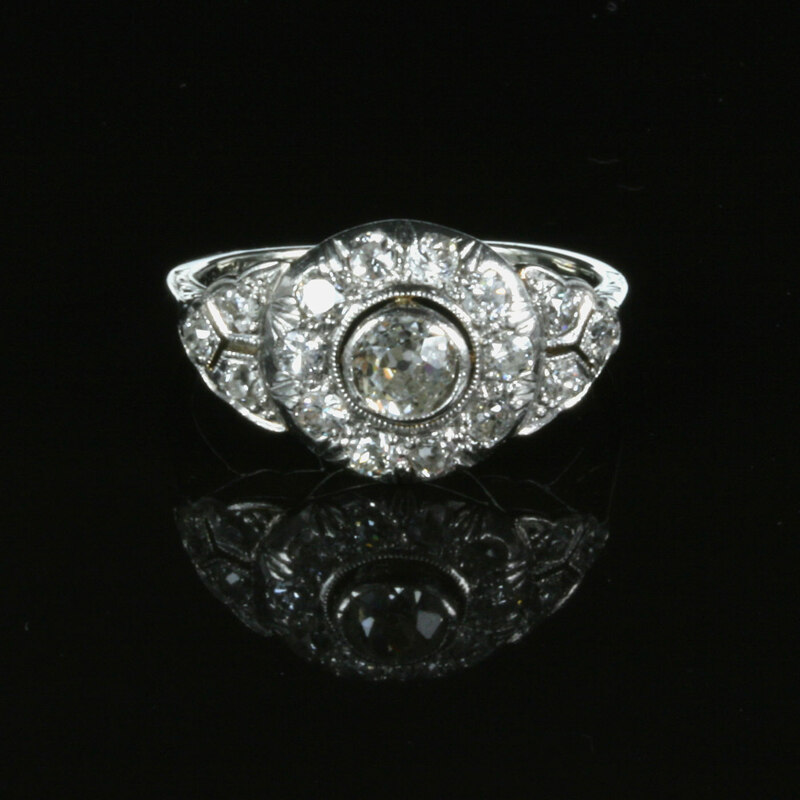 Art Deco rings such as this would serve a multitude of occasions or reasons to own it and is a wonderful example of a very attractive Art Deco diamond cluster ring with a difference and would make a stunning engagement ring that will always be treasured for a lifetime.